The notion of owning an Aston Martin DB9 is tempting. The allure of the curves, the power, the feel. You become infected wondering what would it be like. I’m a life long car guy and I’ve reached 50 years old and can finally indulge a bit. [Insert mid-life crisis jokes here – but I love my Sweetie of 27 years and still have all my hair – life is good] I can’t afford to go drop $250K on a new DB11, but I can generally afford a new luxury or sports car. I’d been carefully watching the used market prices on early DB9 models dropping for a few years until I finally succumbed back in 2013. Can I afford this car after I purchased it? That’s a good question to ask before you commit, particularly if you stretch to just barely manage the purchase. Is it myth or truth that it takes a fortune to run a car like this? After living with mine for three years now, I can share the naked truth with you. Not only my age, but that’s what it has cost per day to own her. $50.01 per day, or $4.52 per mile driven over the 1180 days I’ve owned her and 13,055 miles driven. The car averaged 10.8 mpg. Let that sink in a bit – I’ll wait for you to recover or stop snickering. I arrived at that number by truthfully and factually looking at ALL the costs that go into a car. In a separate, permanent, page on this website I have calculated (in excruciating detail) every last cost of purchasing, running and servicing my 2005 DB9 Coupe. Check out https://aston1936.com/costs/ for the details of what makes up those numbers. How does this compare to something more mainstream? 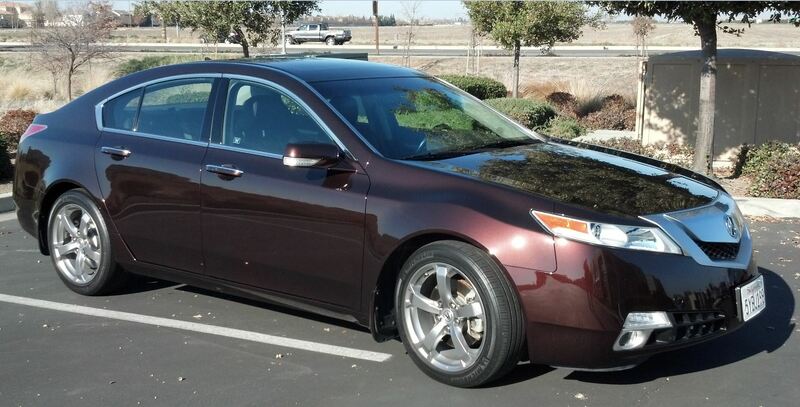 To answer that question I did the same analysis on my last car purchased new, a 2009 Acura TL w/AWD and Tech Package. [A great car other than the ugly beak on the front] You can check out this post with the same level of details to arrive at the costs. I will use these costs to contrast. $22.07 per day or $1.59 per mile driven over 1,970 days (just over 5 years) and 27,307 miles driven. The car averaged 17 mpg. Nearly HALF (46%) of the costs for my DB9 is depreciation. People rarely discuss this aspect of car ownership, but your investment will normally drop in value. It’s nearly equal to all the other running costs combined. If you never plan on selling it, you can just ignore this 46% and what’s left ($27 per day) to be your real out of pocket running cost. 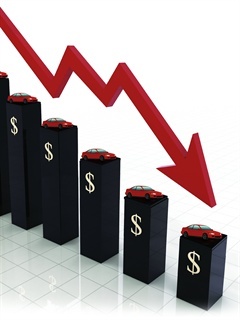 What might surprise you is that depreciation in the first five years of my Acura was 62%. This is typical of most any new car. The original owner takes a severe beating on depreciation. If you think about it the original two owners of my specific car ate roughly $100,000 in depreciation costs alone over the first 8 years. By the time I got it the rate of depreciation has started to level out loosing about $7k per year (which is comparable to the ~$5K per year lost with the Acura). ‘Dave the Car Guy’ discusses this nicely in his blog post on the long term costs of owning a V8 Vantage, and points out looking at some older Aston’s that it takes 25-30 years for the depreciation to bottom out and values to start to increase again. Will a decent condition DB9 every drop much below $40K? Or will it just level out for a while and then start to climb again? Time will tell. This is what everyone freaks out about. “If that engine blows, you’ll be staring at a $30k repair bill”. True – but being an owner and an avid participant in the discussion forums, the reality is that engines don’t blow all the time. The goober video on YouTube by a disgruntled mechanic ranting about a blown DB9 engine fails to point out whether the owner perhaps failed to maintain the oil level, or if it was serviced for the dipstick/oil level recall (read more about that here). My early car has had a total of $8,851 in unscheduled maintenance. Not cheap, working out to $7.50 per day or $0.68 per mile driven. But, this was primarily two major events, both oil leaks of well known problems (detailed on My Car page). If you get a later car, or one with these issues addressed already, you might be spared the expense. 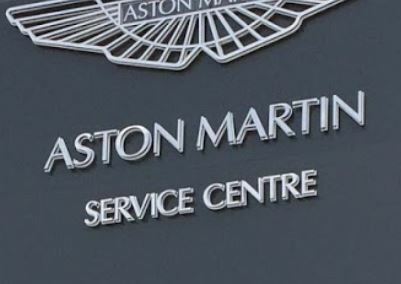 Or, you might consider an optional warranty if you are purchasing the car from an Aston Dealer. Doug DeMuro goes on at length that the $3k he spent on the 1 year warranty for his pre-owned Vantage saved him from a great deal of expense. Something to consider. All cars need routine maintenance. 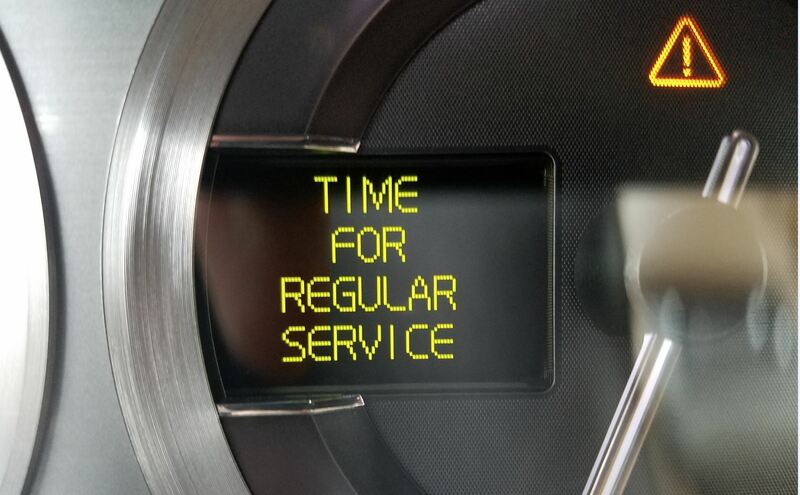 For a DB9 this generally equates to an annual service alternating between a 1-year and 2-year service regime. This is also where some DIY skills can help keep the costs down, and what this website is dedicated to. On my DB9 this added up to about $1,600 over the 3 years equating to $1.35 per day or $0.12 per mile driven. This is certainly comparable to other performance cars. My Acura was a measly $643 over 5 years equating to just $0.33 per day or 2 cents per mile driven. Cheap. Not the same as routine maintenance, wear and tear is what we inflict on them by driving them. If you never drive your car you’ll have none of this expense (and you should be very sad that you aren’t driving your car more). The more miles we drive the more we spend on tires and brakes, etc. Brakes aren’t cheap. Again, you can tackle a lot of this yourself and spare some of the costs (I’ve done my own brakes). DB9 tires are actually comparable to the costs of the Michelins on my Acura. I racked up $3,475 so far in wear and tear, equating to $2.94 per day or $0.,27 per mile driven. Like Death and Taxes, some of our DB9 expenses are unavoidable. Road tax, auto insurance and fuel are just part of the game. As mentioned, my DB9 manages only about 10.8 mpg (awful) versus the 17 mpg of my Acura (not great either). Thank you to all the Prius owners out there for saving the fuel for the rest of us. Auto insurance is certainly more for a DB9, the insurers know that any repair will be super expensive so they definitely stick it to you more than a regular car. But, I suspect that it’s similar to the insurance for a comparably valued Porsche. Road tax (the California DMV where I live) is very similar to the Acura. Essentially, you’ll pay more for each of these, but probably not enough to break the bank. The DB9’s costs were $12.43 per day or $1.12 per mile driven, compared to $7.74 per day or $0.56 per mile driven in the Acura. 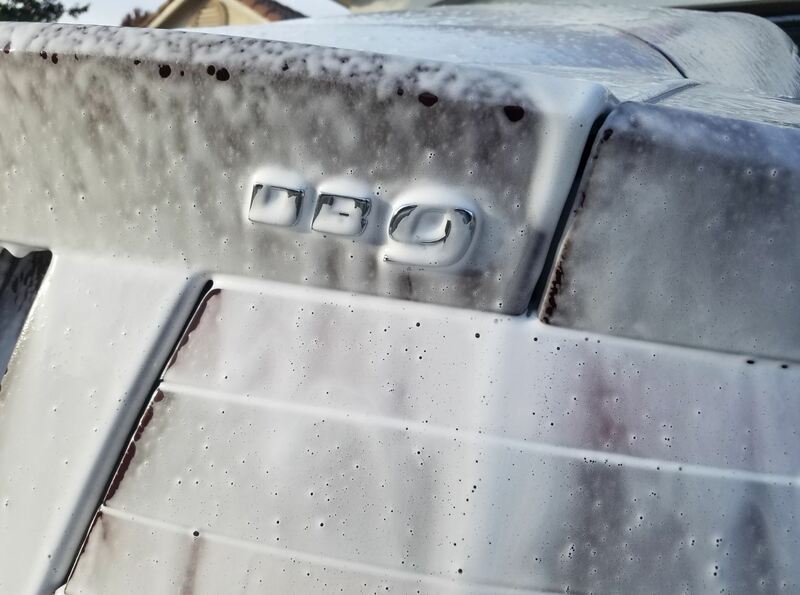 We wash our cars and/or we may pay a detailer to do it for us. You might be a do-it-yourselfer like me and need a few new tools to look after her. I joined the AMOC and participated in several of their organized low key track days [highly recommended]. 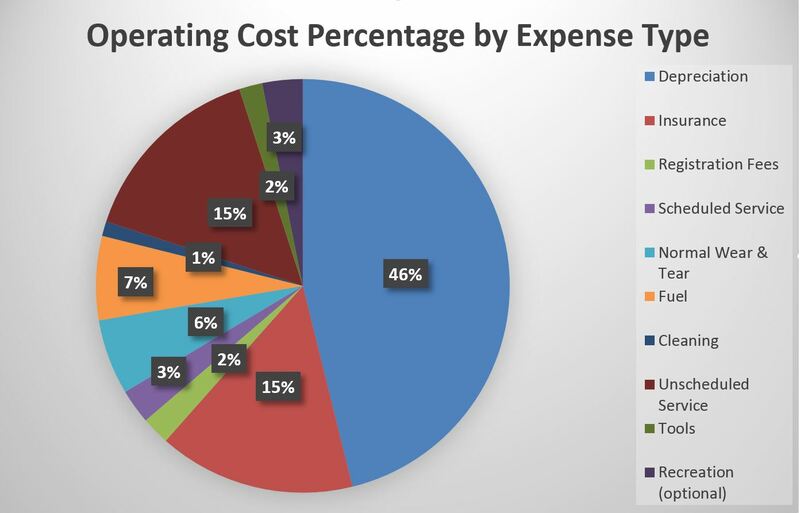 All of these are still ‘expenses’ and I include them for the sake of thoroughness, but these would be comparable to doing the same things for any performance car. These added up to $3,603, that works out to $3.05 per day or $0.28 per mile driven. Compare this to just $680 ($0.35 per day or 2 cents per mile) for the Acura, which I basically just had detailed periodically and I never did anything particularly fun with it. I am less worried about the miles on the car. 15k vs 18k vs 3k. Probably relates more to the knicks and chips than the mechanical worthiness. These cars are generally strong. A car routinely dealer serviced every year on schedule would be ideal. Certainly not specialist or self serviced during the initial warranty period. At a Dealer all the Field Service Bulletins and recall work would have been done automatically – meaning most of the niggles on the early cars would be fixed for you already. A specialist or DIY’er may not have knowledge of the FSBs. A full dealer serviced history would be the best. A full and detailed service history with receipts showing the details of each maintenance and unscheduled repair. Just having dealer service stamps in the owners manual doesn’t tell you what’s been ‘fixed’ along the way. It would be very useful to help know if the common faults (like the lumpy idle issue caused by weak Coil Packs) were already addressed at the previous owners expense. No accident history – period. If its been in a crash, look for another car. I got a CarFax report to check this, plus the service history might include something. Would buying an optional 1 year warranty be worth it? If it would give you peace of mind and only cost a few thousand, I would consider it. If buying again I’d try and get a low mileage MY 2007 versus the slightly cheaper early MY 04-06 years. There is a price premium of maybe $10K, but most of the original issues were resolved by ’07 and many of the early optional features became standard features by 2007. I definitely recommend that you check out “The Definitive Buyers and Enthusiast’s Guide to new Gaydon era Aston Martin” by Grant Neil. Starting at Page 150 he does an excellent job describing the features and options of each model year. So, if you are looking at a $100k Audi, Merc or 911 consider this. The depreciation of you’ll be hit with over the first three years is about $40k. Sure it’s in warranty and you won’t have those costs to worry about, but all my unscheduled service and depreciation added up to just $36k. Fuel, insurance, wear & tear, and play would be about the same. Could you see yourself in a preowned DB9 instead? I think so [and wouldn’t you look good in it]! If you are on the fence, I’d heartily recommend you go for it. Don’t get hung up on the inevitable niggles and just enjoy the visceral ROAR everytime you push the Start button. When the niggles arrive [and they will, it’s a hand built British car] check back to this website to see if I have some of the solutions for you. If you’d like to see me expound on this in video, here ya go! But then again, if you’re REALLY desperate for an Aston, you can get a very early model with shoddy paint for only £24k if you look hard and are very patient! That’s about $30k or less. I’ve had mine for 2 years now and have only done about 3,500 miles but that’s because I’m disabled and retired, have no reason to drive other than for pleasure and have been spending much of my ownership trying to find a cheap alternative to a full respray! The solution will almost inevitably be a quality wrap after I’ve carefully repaired all the little areas of bubbling – at least one on every single panel, I kid you not! These repairs will be diy using varied papers, airbrush and quality OEM paints. The wrap is expected to cost about £15-1700 and it will match the original colour. I know it’s not going to look even halfway decent but I only require a good flat finish on which the wrap can go. Other than this cost yet to come, my expenses to date have been one full service at an independent AM specialist (£1000 including routine parts and fluids plus brake pads all sourced by myself online – at about a 20-40% saving), one replacement rear led light unit (£200 for the pair on eBay), leather repair to seats and dashboard (£400). I still have ongoing projects such as replacement satnav screen to utilise my phone’s navigation and a reversing camera (all in for under £120, courtesy of Ebay again) and fitting the OEM 18″ wheels in excellent condition too that I found online for £220! This is to help soften the ride for both myself and my wife as we both have chronic back problems. That should happen when I’m fitting new rubber (Micheli PS4s or PSSs) later this year, again sourced online for a 20-30% saving against your local tyre shop. I also have a Dension 500 unit for my DB9, yet again from Ebay (£60!) which needs fitting along with replacement door rubbers at about £230 via eBay yet again! The good news is that my stepson, having just turned 25 and also being an excellent mechanic, has now been added on my insurance for only £220 per year and this is all the motivation he needs to help get the car back into good condition! One other thing we did was to remove the dampers and send them to a suspension specialist for softening (yes, I found the original damping to firm for comfort – my bad!) and that came to £500 including shipping. My insurance is below £500 a year (without my stepson) through the AMOC scheme and I get an average mileage of around 15 mpg (UK gallons!). I expect to make much more use of the Aston this year but given its age (it was one of the first 50 sold in the UK), the price I paid for it (£24k) and the fact that the initial owner had a replacement engine at about 30k, meaning that my engine only has 42k on it, I don’t think depreciation has much effect on its market value. I look forward to many years of Aston enjoyment! I’ll just have to keep a keen eye open for bargains online! Aston ownership does not necessarily require deep pockets, it’s just that you need to trim your cloth accordingly, you should be prepared to get your hands dirty and you need to do plenty of online research and bargain hunting. Then, even a medically retired wheelchair driver can still have that special ASTON feeling! The headlining needs replacement as it’s sagging badly. Another diy job that is budgeted at around £100. 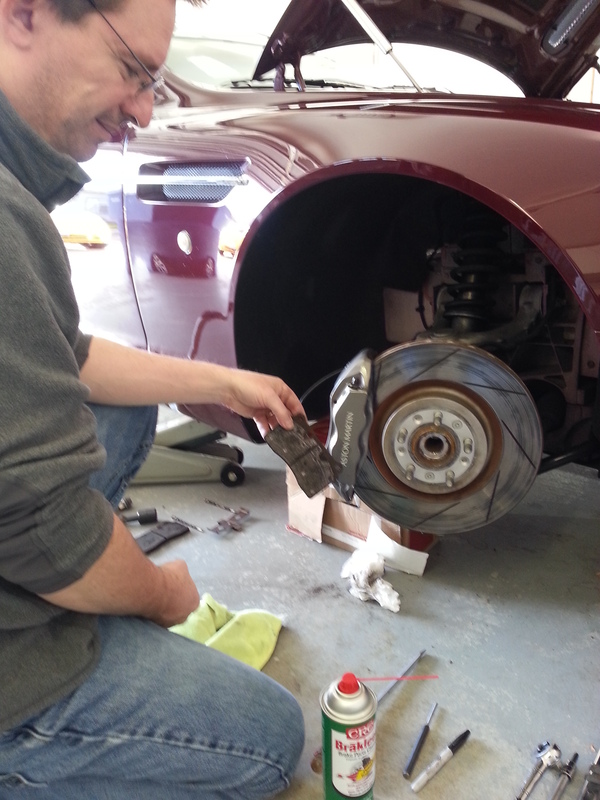 One rear brake calliper has a leaky piston seal – £100 to repair or £230 to replace. One of the bushes on the rear suspension is seized in place and I’m not sure what I’ll end up doing with this but I don’t think I’ll have to go the whole way and get a new wishbone, I’ll find a cheaper solution somehow! I think I need a new boot seal as my wheelchair, this one lives in the boot/trunk of the Aston, has developed a severe case of mildew over the past winter. I’m sure there’s even more but I can’t think of it just now! 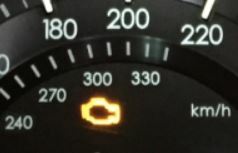 You mentioned the previous owner had an engine replacement , I have a ticking noise coming from my car only after it warms up, iv read this could be a serious problem leading to an engine replacement, anyone has any previous knowledge of this what I’m lead to believe is a common problem? I wouldn’t feel knowledgeable enough to offer any judgement or advice on the ticking engine. Perhaps Steve would like to comment. My engine was replaced because of the classic early DB9 problem caused by the short dipstick which should have been addressed on all cars by now, however you can always check the part number on your dipstick just to make sure! All the same, I don’t think that a ticking sound on an engine only after it’s warm is suggestive of the oil starvation problem that I had. I’m sure you will get other far more knowledgeable answers here shortly.